Horseshoe accessories are a timeless look for the decor of any home or office. If you can imagine it, there is probably a horseshoe decor item available for it, from horseshoe coat racks, wine racks, outlet plate covers, pictures frames, and much more. Below is an excellent selection of horseshoe decor items for sale on Amazon and eBay. 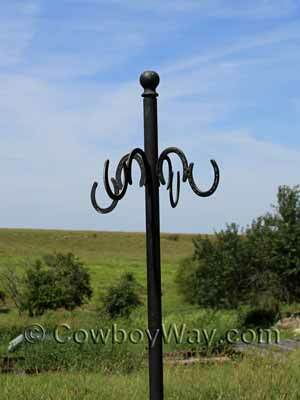 Below: Functional horseshoe decor: A horseshoe coat rack. You can usually find all kinds of horseshoe decor on Etsy. The selection ranges from already made items that are ready to ship, to items that are customizable and won't be crafted for you until you place your order. 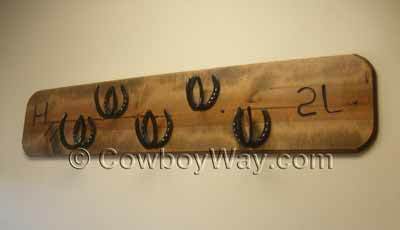 Below: Horseshoe decor from the Iron N Lace Etsy shop. From the "About" information on Iron N Lace's Etsy shop: "Shop designs may be shared on social media, websites, and blogs if they refer back to our Etsy store. Thanks!" It wasn't too long ago that most decor items made from horseshoes were made from real, used horseshoes: Iron shoes that had been put on a horse, then removed when the horse was reshod. This was because cowboys and other handy folks simply used what was readily available, and for a lot of folks a steady stream of used horseshoes was a natural part of their life. These days, however, that often isn't the case. 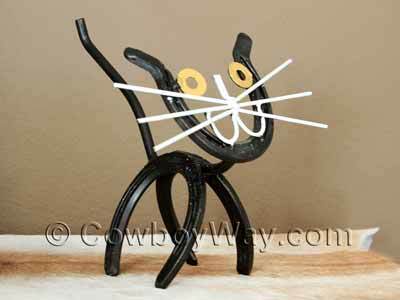 While a lot of folks still re-purpose used horseshoes for making all kinds of decor items, most of the items available for sale to the public are made from new horseshoes, not used. And sometimes, the horseshoes aren't actually, well, horseshoes. They're made to look like a horseshoe, but they were made to be used in crafts and decor items, not for putting on a horse's hooves. 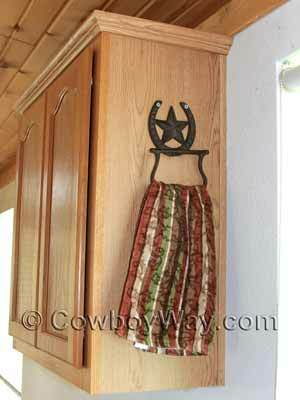 Below are a few photos of horseshoe decor items. 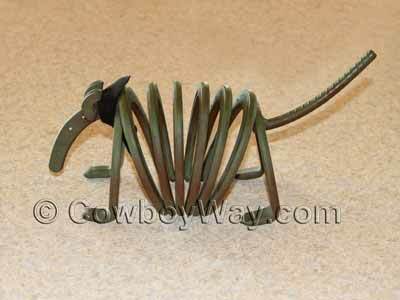 Below: A horseshoe armadillo. A cute and useful item either for holding letters on a desk or napkins in the kitchen. 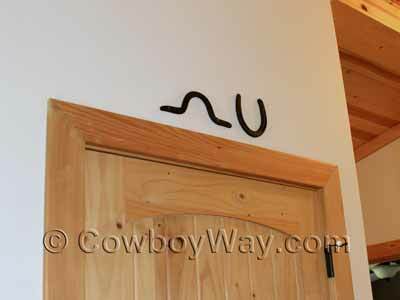 Below: A horseshoe towel rack/holder. 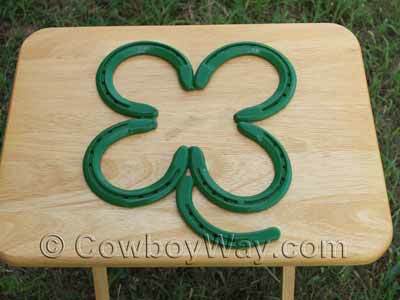 Below: A horseshoe trivet in the shape of a cloverleaf for kitchen decor. Below: A horseshoe brand over a door inside a house. Below: The top of a horseshoe coat rack or bridle rack. 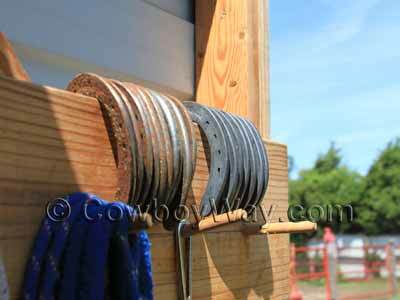 Below: Horseshoes hanging on the door of a feed room: Used horseshoes on the left; new horseshoes on the right. 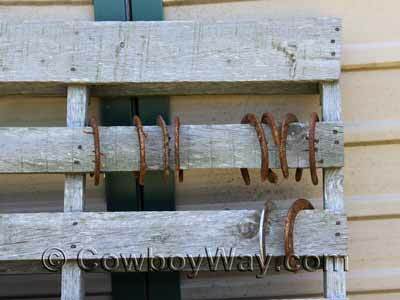 Below: Used horseshoes hanging on a wooden pallet. They're easy to find until an idea for the next project comes along.